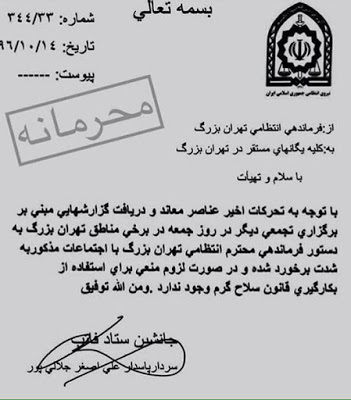 The document you see on the image is the order of the commander of the Tehran repressive force to all the units based in the city. Based on this agenda, the mercenaries of the corrupt government Islamic Republic of Iran have been allowed to use firearms in the event of any protest movement against people by the regime. This is a murder command. The repressive force of the law, known to the world's famous police and guardians, should protect the lives of its citizens, by freeing their mercenaries, they allow them to murder Iranians who are protesting the corruption in the government and you have the important message that if you come to the streets in protest of corruption and torture and massacre, we will kill you. Because, according to criminal Khomeini, maintenance of the system is obligatory. A corrupt government that is so hideous that spend billions of dollars from the national treasury and popular capital to the suppression of its people and the countries of the region, must be overthrown. It's been forty years now that our country has been occupied by these genocide Mullahs and imposed Islam. It is still hard for some to understand that our country is literally occupied by Islamic fundamentalists. The corrupt regime of the Islamic Republic calls on the protesters of Iran to be turbulent and trash and heavily suppress on the pretext of breaking a few glasses and burning a few trash bins. What happened to us that they call us not only as an alien but also an enemy in our home? Why should we keep silent about this apparent aggression that goes on to lead to the extinction of our Iranian spirit and with our passivity, let this corrupt and liar government expresses against these people who seek their own rights? Our people should finish off with this corrupt regime today, not too late. These criminals live in an unprecedented fear of our violent rage. Do not allow the overthrow of this sovereignty to become a ritual of overthrow and we have been screaming against these so many tartufe and dishonest every few years and we have been suppressed every time. Do not leave the streets this time, and do not descend to the complete overthrow of this corrupt ruler.